Benjamin Zander‘s new recording of Beethoven’s Symphony No. 9 (“Benjamin Zander Conducts Beethoven Symphony No. 9 ‘Choral'” available on Brattle Media) is the result of a lifetime’s study of Beethoven’s score. But spend any time with Zander and you come to realize both how absorbed by the music he is, and how his study of it has not been intended to perfect his own interpretation but to divine Beethoven’s intentions. I recently met up with Zander to talk about the new recording and the ideas behind it, particularly with regard to his interpretation of Beethoven’s metronome marks. Does the world need yet another recording of Beethoven’s Ninth Symphony? Zander feels very strongly that it does. He has worked on the symphony for over 40 years and given many performances of it. He is passionate about investigating Beethoven’s original score and feels that the new recording is the first time that all the best musicological points have been made in the same recording. Recording the work with the Philharmonia Orchestra, the Philharmonia Chorus, and soloists Rebecca Evans, Patricia Bardon, Robert Murray, and Derek Welton, Zander received an enormous amount of rehearsal time, particularly for a work that the orchestra could probably play in its sleep. There were three rehearsals (the last one with chorus and soloists) and five recording sessions. The response of many of the orchestral musicians was to comment that they had never really studied the piece. And the chorus members, who had not been looking forward to the recording, found it a revelation, and many came out ecstatic. One of the focuses of his new recording is Zander’s interpretation of Beethoven’s metronome marks. Ever since he was a small boy, Zander has been fascinated both with Beethoven and with the tempos of his symphonies. 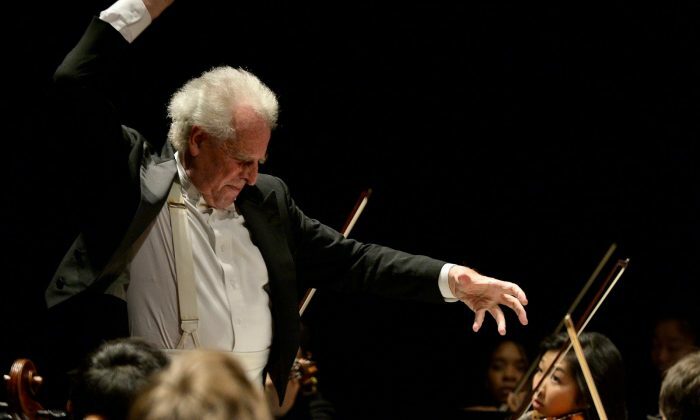 Back in 1967, Zander conducted his first performance of Beethoven’s Symphony No. 5 in Boston, and it caused a sensation because of his approach to the tempos and to the music. No one had heard Beethoven that way, and everyone was talking about it. This was the period before historically informed performance had reached Beethoven. So, in a sense, Zander has spent a lifetime as a pioneer and is proud of it. He points out that now news travels fast and new interpretations are heard and shared rapidly, but back in the pre-internet days things happened slower. He readily admits that there were other pioneers before him, who experimented with Beethoven’s tempos, but none of these made a global impact. Zander took the idea to the BBC, and they were interested in his theories about Beethoven’s tempos but insisted it had to be done on period instruments. Eventually, a BBC performance was given by Roger Norrington with a period instrument ensemble. Beethoven was very keen on the newly invented metronome, as it enabled him to be even more detailed about tempos. His Italian tempo markings in the score are quite complex in an attempt to come to grips with delicate variations of tempo. But the metronome Beethoven was using had limitations: The speed only went down to 50. And the transcription of Beethoven’s metronome marks was not done without error, so Zander went back to Beethoven’s conversation books, where an interaction with his nephew Karl clarified Beethoven’s exact intentions. Many of Beethoven’s metronome marks are uncontroversial, and in the narration that accompanies the new recording, Zander goes through them in detail, showing how the majority of conductors adhere to them. But a few are controversial. The final movement of the March is one example. Originally it was thought to be a slow tempo, but by examining the original conversation book, Zander came to realize that the tempo Beethoven was aiming at was far faster. With the new tempo, in the final movement of the March, when the full orchestra is released, the musicians have to play stupendously fast. At the recording takes, they only once managed the correct tempo—“a white knuckle ride,” Zander recalled. But the leader of the orchestra, Stephanie Gonley, suggested that the string players bow the fast passage on the string rather than off it—something that would have suggested itself easily to period performances—and this made the increased tempo possible. Zander uses this as an example of how the orchestra was very much on his side for the recording sessions. One of the more controversial areas is the trio of the Scherzo, which one observer at the very first performance referred to as having unusual exhilaration—something that does not happen with the traditional, slower speed. And, as Zander points to a motif that repeats some 27 times, he feels that the faster tempo makes sense of the repetition. Another of Zander’s key points is that orchestras rarely play Beethoven’s exact dynamics. Repeatedly during our study of the score together, he pointed out places where pianissimos are ignored and where fortes are played fortissimo. For example, the orchestra is marked pianissimo at the beginning, and the first entry of the soloists is another key point, rarely taken quietly enough so that the soprano soloist doesn’t swamp the mezzo-soprano. Zander asked the soloists and the chorus members to express the emotion of the words instead of shouting them, because there is a remarkable amount of piano marked in the score. Some of these details were tricky: The final ensemble “vor Gott” is fortissimo with a diminuendo because the following passage is piano, and then in the following passage, the piccolo is supposed to be pianissimo. It is to achieve such details that the three rehearsals were needed. Zander calls himself essentially a teacher. His new recording of Beethoven’s Symphony No. 9 includes two discs of introduction, explaining how he reached the conclusions he did regarding the tempos and other issues. The aim is something more than purely academic. He hopes that the general populace will listen to the explanations and get a deeper understanding of the music, and he hopes that he is teaching people how to listen to the music. With that in mind, Zander takes a practical view of the score as well. There is a viola passage in the last movement that is usually never heard; Zander attributes this miscalculation to Beethoven’s deafness. To compensate, he doubled the violas with the horns, making the musical line present in the overall texture for the first time, something he finds very satisfying. And he has adjusted the timpani parts, as Beethoven was limited by the timpani of the time whereas modern timpani are more flexible. Hearing the results of the performance, which Zander calls electrifying, he believes that we can come to understand that Beethoven was in extremis, living on the edge of the universe and pointing to things which we can only imagine. There are passages that reach maximum joy, yet Beethoven himself was in the depth of darkness. You can hear more about Benjamin Zander’s performance of Beethoven’s Symphony No. 9 on the trailer on Vimeo. This is an edited, shortened version of the original article, which appeared on Planet Hugill. Robert Hugill is a composer, lecturer, journalist, and classical music blogger. He runs the classical music blog Planet Hugill, writes for the Opera Today website, and Opera Today and Opera magazines. He lectures and gives pre-concert talks on opera and classical music in London. As a composer, his disc of songs “Quickening” was issued by Navona Records in 2017. This article is reprinted with permission from Planet Hugill.